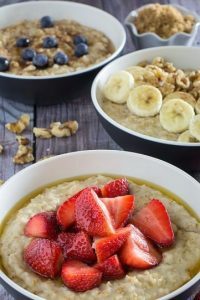 Instant Pot Steel Cut Oats in 20 Minutes is hands down the best way to feed a hungry family in a very short amount of time. 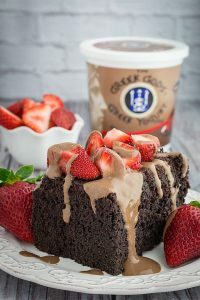 It’s a healthy start to your day and the topping ideas are endless! 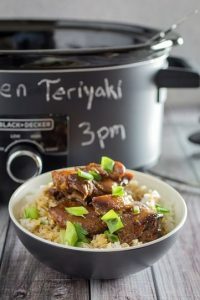 I’m officially starting to get the hang of this Instant Pot thing! It’s basically an electric pressure cooker. And with that comes Instant Pot Steel Cut Oats, or pressure cooker steel cut oats. I made this in the morning, and set out a few bowls of nuts, berries, honey, maple syrup, and spices like cinnamon and pumpkin pie spice. My family went nuts for it, and I’m sure yours will, too! 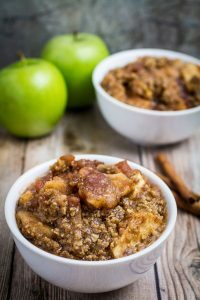 Here’s the thing about Instant Pot Steel Cut Oats. First and foremost, if you’re gluten free like me, you need to make sure you’re buying certified gluten free oats. I know I’ve talked about this before, but it’s worth repeating. Oats are only gluten free when they are certified, otherwise there’s too much cross contamination that happens when they are grown. Just A Few Instant Pot Steel Cut Oat Tips! 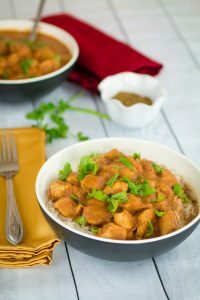 Only fill your instant pot half way! This is crucial. You don’t want to fill it all the way to the top, and then have the pressure pushing the oats out of the valve. With half of the pot, we had at least 6-8 servings to go around. Don’t release the pressure valve! And I mean it. Don’t release that thing. Unless you want oats squirting up onto the ceiling. 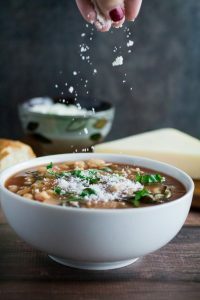 What we’re going to do here is use a natural release, which means that you shut the instant pot completely off and let the pressure stabilize naturally, which takes about 5 minutes. 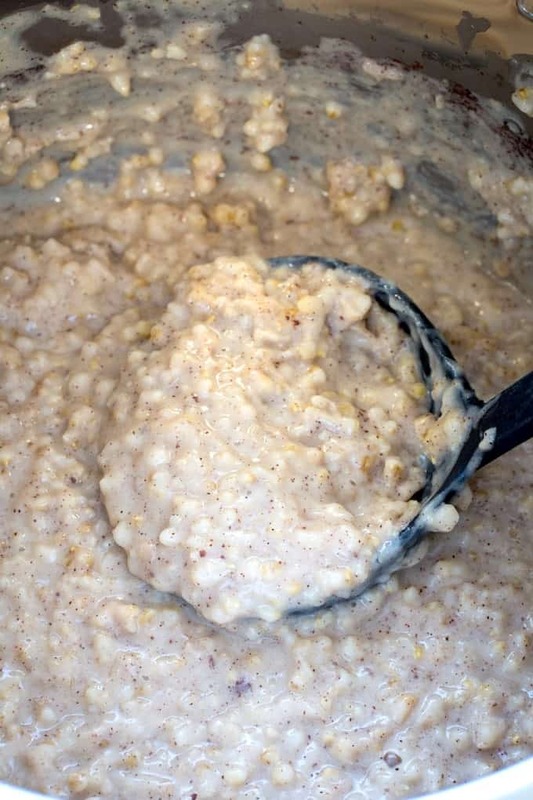 Season your oats before you cook them. 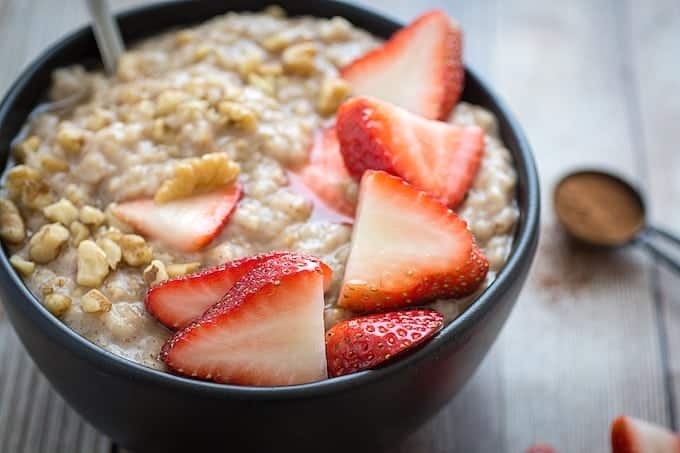 Don’t forget to add some flavor to your oats so they can really absorb it along with the water! Think salt, cinnamon, pumpkin pie spice, etc. How creamy they are depends on your cook time. If you want creamier oats, set the pot for about 15 minutes. If you want them a little less done, go for 10. I picked a happy medium in-between of 12 minutes. A little creamy, a little chewy, everyone wins. 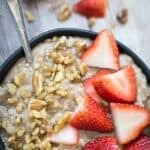 Create An Instant Pot Steel Cut Oats Toppings Bar! I’m no stranger to a good old-fashioned toppings bar, and you shouldn’t be, either! It’s fun, super easy, and everyone has a really good time with it. Fruit. I usually set out whichever fruit looks the best, like strawberries, blueberries, or bananas. I’ve even just thrown a cup of frozen berries in a pot for a few minutes, along with a tablespoon or two of water and sugar, to make a really delicious fruit syrup. Sweet. Don’t forget to add some of the traditional sweeteners, like honey and maple syrup. 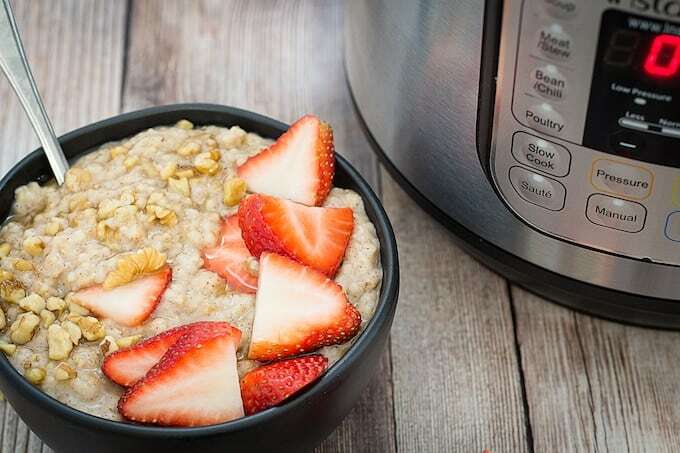 In my house, it’s not instant pot steel cut oats day without them. You can also add stevia if you’re trying to cut back! Savory. My sister likes savory oats. It’s not my cup of tea, but apparently it is a thing. So I’ll slice up some avocado and make a few fried eggs to go along with hers. Nuts & Seeds. Don’t forget that texture! Add some walnuts, almonds, or pecans. Or even a handful of seeds like pumpkin, sunflower, flax, or chia! 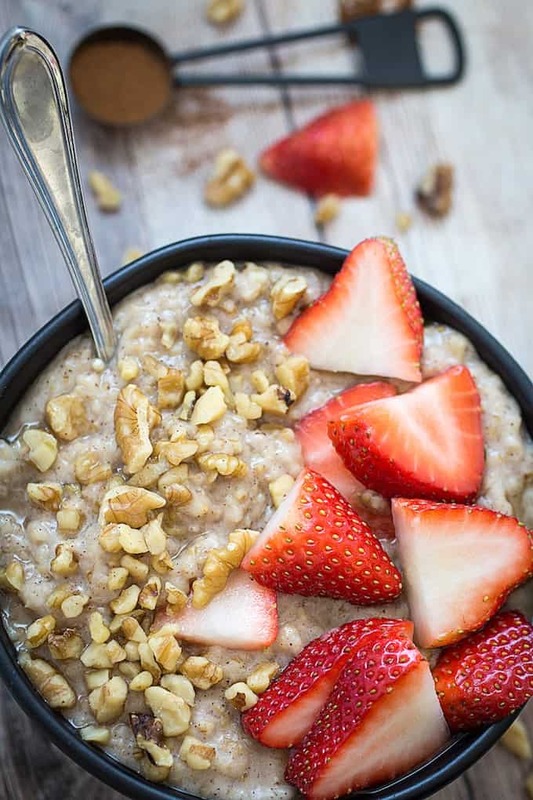 Instant Pot Steel Cut Oats in 20 Minutes is hands down the best way to feed a hungry family in a very short amount of time. It's a healthy start to your day and the topping ideas are endless! 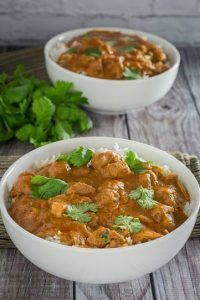 Add all ingredients into instant pot and stir. Lock lid in place and make sure release valve is sealed. Set for 12 minutes on high. When 12 minutes is done, let the pressure release naturally, about 8 minutes. 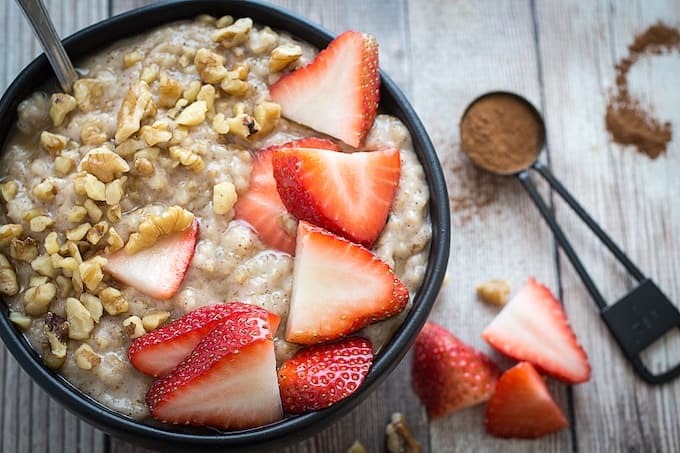 When oats are done, add your favorite toppings and stir! 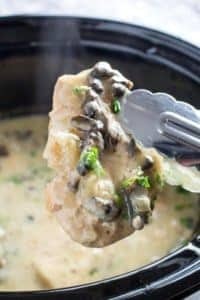 Use a natural release when the oats are done cooking. Do not release steam with the valve. Previous Post: « How To Make Granola – It’s Easy!